When working with the Portable Antiquities Scheme (PAS), the concept of a ‘forward job plan’ is somewhat laughable – your work patterns are largely dictated by finds made by detectorists. Some discoveries can completely change your career as the Frome Hoard did for me when it was found by Dave Crisp in April 2010. Dave had dug down a foot into the ground when he started to pull out pottery and coins from the clay soil. When he realised that he had found a coin hoard, he made one of the most important decisions of his life – he filled the hole in, walked away, and contacted his local PAS Finds Liaison Officer for Wiltshire, Katie Hinds. Katie contacted her opposite number in Somerset, Anna Booth, and a professional excavation of the site took place under the direction of local archaeologist Alan Graham. 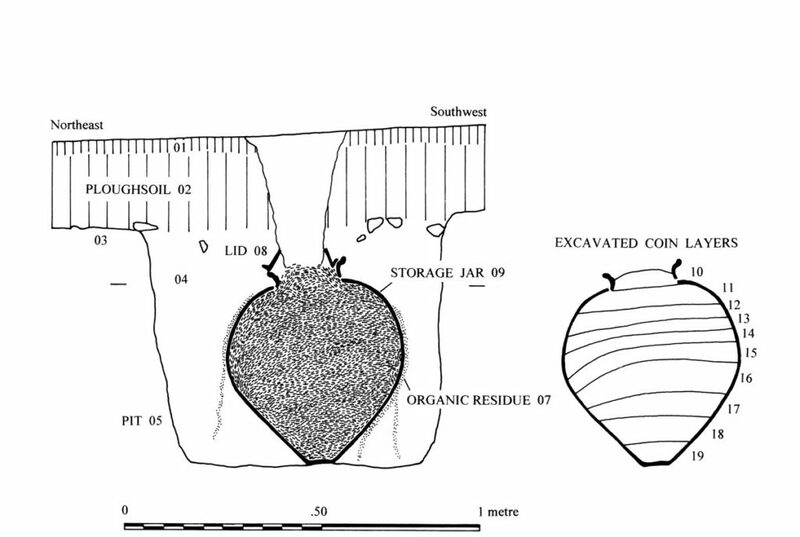 Section drawing by Alan Graham and Anna Booth. I first heard about the hoard when Katie rang me up in London. When she gave me the diameter of the pot (45cm) I immediately knew that we had a ‘monster’ hoard of tens of thousands of coins. 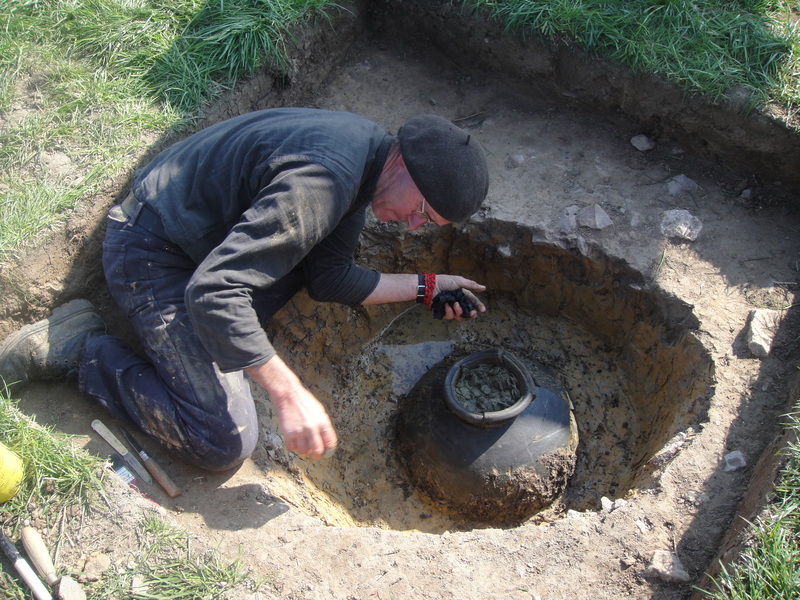 We agreed that the pot should be excavated in layers – this took two days and resulted in 60 separate bags from specific parts of the pot. Roger Bland (then Head of the PAS) and I collected the coins the day afterwards and drove them back to the British Museum where they were immediately entrusted to Pippa Pearce, Senior Metals Conservator, who gave them all a ‘wash and dry’ to stabilise them. We quickly ascertained that the coins weighed 160kg, and six weeks later Pippa pronounced a total of 52,503, making the find the second largest Roman hoard in Britain. Roger and I, with assistance from colleagues, then took twelve weeks to sort the coins by emperors. 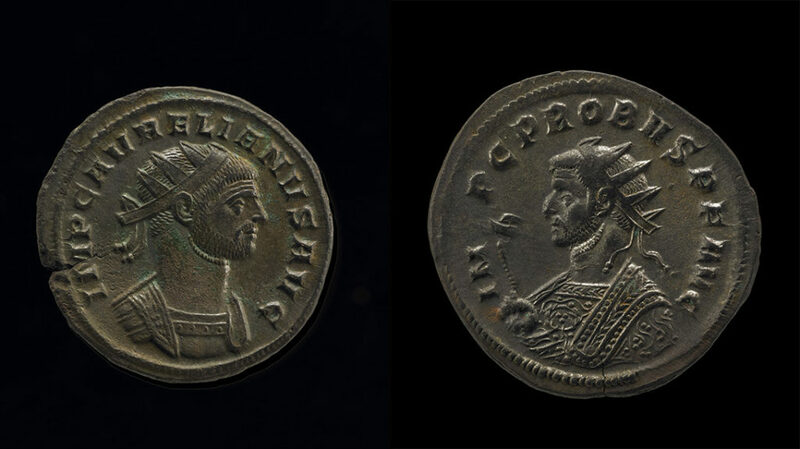 The coins spanned from c. AD 250 to 290 and covered about 30 rulers, terminating with Carausius, a renegade emperor who ruled in Britain from 286 to 293. 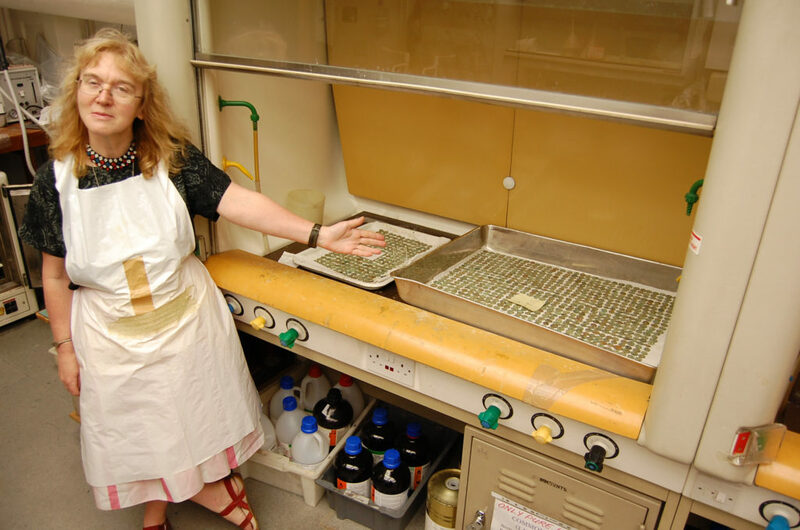 Pippa Pearce, Senior Metals Conservator, drying coins. At the same time we were working with Steve Minnitt at the Museum of Somerset in Taunton to plan a campaign for his museum to acquire the coins. With the BBC we mounted a major publicity campaign, numerous media outlets subsequently covering the story, we put on a display of some of the coins in the British Museum, we were filmed for TV series Digging for Britain, we wrote a short introductory book (in ten days flat) and started to negotiate with the Art Fund in Somerset. After numerous events in Frome and elsewhere, £320,000 was raised to acquire the hoard, the Headley Trust and National Heritage Memorial Fund (NHMF) and the Art Fund making enormous contributions. Dave Crisp and the landowner, following the statutory requirements of the Treasure Act, shared the money. Left: Radiate coin of Aurelian (r. AD 270–275), struck at Siscia (Sisak, Croatia). Right: Radiate coin of Probus (r. AD 276–280), struck at Ticinum (Pavia, Italy). We also received £105,000 from the NHMF for conservation, and for the next four years Pippa and her team worked their way through over 30,000 coins – a legacy of the Frome Hoard in the Conservation Department is ‘Coin Wednesday’ when all metal conservators work on Roman coin hoards (of which we now receive over 50 a year). 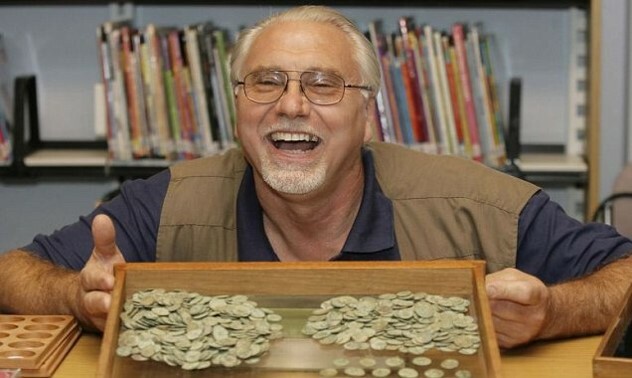 A wide range of numismatists have helped to catalogue the hoard, notably Richard Abdy, Eleanor Ghey, Vincent Drost, Andrew Brown and Fernando Lopez-Sanchez, and we are now down to a few thousand coins of Claudius II. I have catalogued, with the assistance of Graham Barker, the 850 plus coins of Carausius which contain a host of new types and varieties – fortuitous because I had just been tasked to write a new edition of the Roman Imperial Coinage for Carausius and his successor Allectus. The Frome coins also suggest to me that enigmatic coins of Carausius marked with a ‘C’ were struck at his court, wherever it happened to be – the location of this mint has exercised scholars since the days of antiquarian and archaeology pioneer William Stukeley (1687–1765). 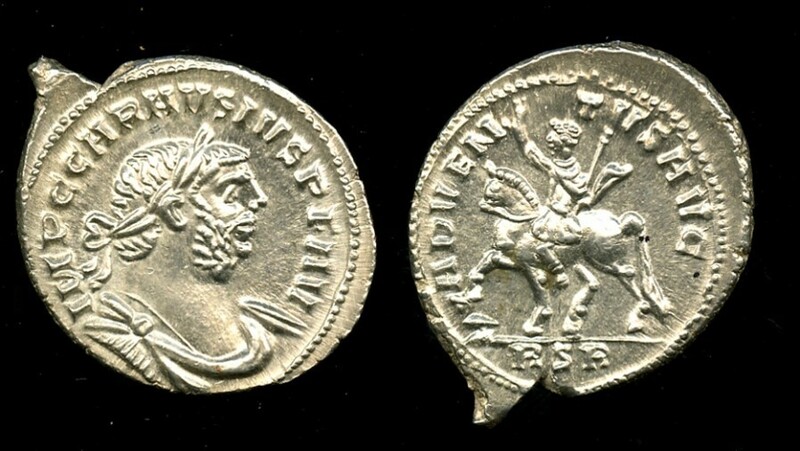 Silver denarius of Carausius (r. AD 286–293). 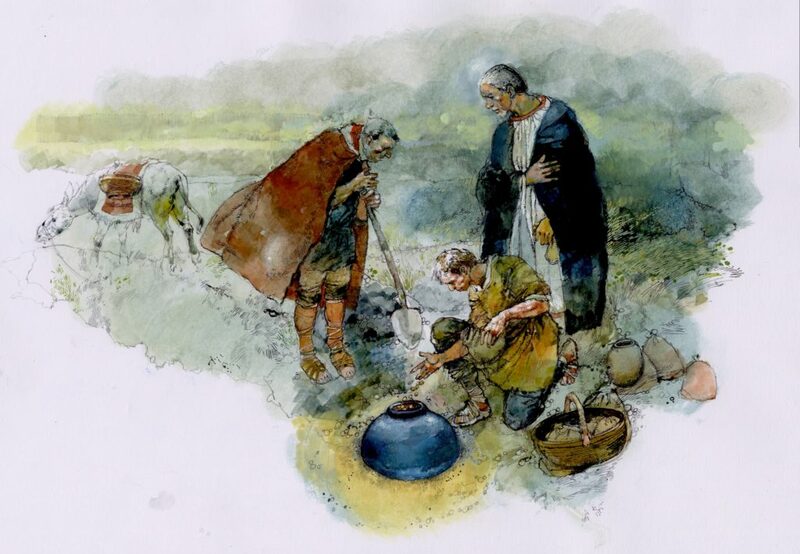 The hoard was buried on high ground which could be quite boggy after rain, suggesting a spring in the vicinity. This led me to believe from the outset that this hoard was probably a ritual deposit rather than a cache buried for recovery. When we discovered that the latest coins in the hoard were in fact halfway down the pot, it was clear that the pot was placed in the ground and then filled from a selection of smaller containers – I had visions of a local community making a communal offering. A reconstruction painting by Victor Ambrus, of Time Team fame, showed the possible scenario. However, my suggestions led to a number of quite aggressive emails from across the globe which did not subscribe to my ritual theory. A reconstruction painting of Sam’s theory by Victor Ambrus. Because of the debate generated about the reason for the burial of the hoard, Roger Bland and I thought that a deeper study of Romano-British coin hoards might attract research funding. Partnering with Professors Colin Haselgrove and David Mattingly at Leicester University we were able to secure funding for a three-year project from the Arts and Humanities Research Council. The monograph for this project is in preparation, but I can tell you that the Frome Hoard was indeed buried by an ancient watercourse. Furthermore, it does seem that a number of other hoards were buried for ritual reasons. The project has resulted in all Iron Age and Roman coin hoards ever found in Britain being entered on the PAS database and these records will soon be made available to the public. Some of the coins from the hoard. Dave Crisp’s decision to leave the hoard in the ground has had an enormous impact on other metal detectorists’ practices. 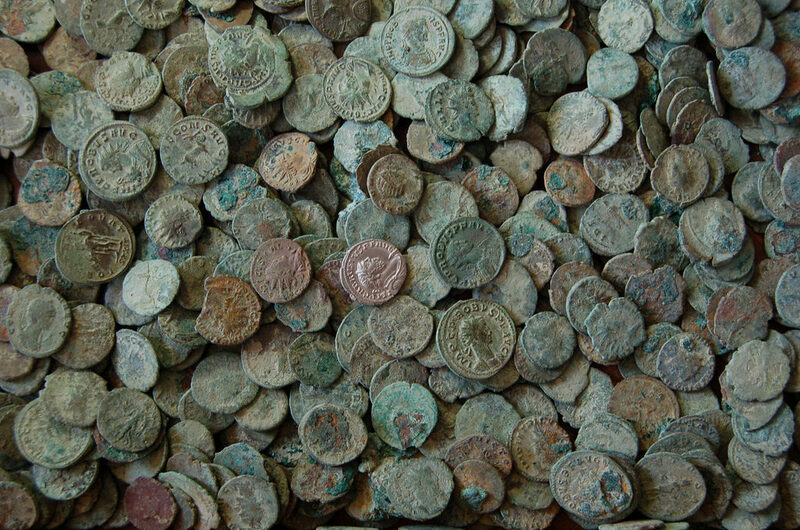 Several coin hoards have been excavated professionally since 2010 and many have been retained in their pot for us to excavate at the British Museum. It will be probably the most important legacy of Dave’s discovery and one for which he deserves enormous credit. Dave Crisp with a selection of coins from the Frome Hoard. Finally, the hoard was the catalyst for a schools’ activity run from the Samsung Digital Discovery Centre. Children are able to take the roles of finders, curators, marketing staff and other people involved in the Frome Hoard story, and it has proven very popular. The Frome Hoard has had an enormous impact on the life of Dave Crisp, but also on the lives of archaeologists, curators, university academics, conservators, schoolchildren and the general public. We hope that many of these experiences can be encapsulated in the final publication which we will start to work on when the cataloguing is finally completed. Sam’s 2010 book The Frome Hoard is out of print but still available. Find out more about Treasure 20 on the Portable Antiquities Scheme website. You can view more images of the Frome Hoard on Flickr or see the real thing on display in the Museum of Somerset in Taunton.